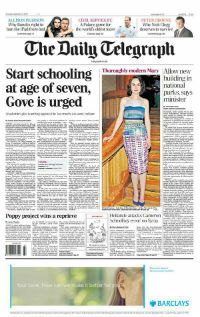 Last week the Telegraph's front page displayed a direct appeal to Education Secretary Michael Gove: "Start schooling at age of seven." A letter sent to the Telegraph by a group of 130 experts and campaigners warned readers about the "impact of the government's early years policies". "Children who enter school at six or seven - after several years of high quality nursery education - consistently achieve better education results as well as higher levels of well-being." The Department for Education however seems to disagree, and a spokesman for Michael Gove was quoted in the Telegraph as saying the signatories were "misguided," adding that they "are responsible for the devaluation of exams and the culture of low expectations in state schools." As often happens with heated debates, there's a wealth of evidence on both sides of the debate. Here is what's being used by teachers, campaigners and experts on both sides. We contacted the Too Much, Too Soon campaign to ask which research underpinned their position. They pointed us to two pages here and here summarising some of the research available on school readiness, the importance of play, general research on early years education and wellbeing. When we asked for specific evidence in support of their argument on better pupil achievement, they referred us to three papers. The first one is a 2010 working paper by the Institute of Fiscal Studies which focuses on the attainment gap between August- and September-born children. The IFS found that "children born later in the school year perform significantly worse in exams than those born earlier in the school year." However this relates to the attainment gap between August- and September-born children, and not specifically on that between children who start school aged 4 or 5 and those that begin aged 6 or 7. Secondly we were directed to a review of the Child Development Assessment Profile (CDAP) commissioned by the Welsh government. This is a form of assessment for children in Foundation Phase (aged 3-5), which was eventually withdrawn by the government following the report's criticism. Although the report did find that children of these ages with English as an additional language are penalised when assessed in English, this relates specifically to languages. The report itself doesn't address how children's performances are impacted by an early start in school. Lastly, a 2012 paper by the Association for the Professional Development of Early Years Educators (known as TACTYC) lists a series of studies in favour of a late start, and suggests that there is "very little evidence as to the rationale for children starting at the age of 4 in English Reception classes" and that "many early years educationalists suggest that what children need from their early schooling is the opportunity to continue their learning through informal pedagogies — ideally up until the age of seven — in an environment which offers rich stimulation and sensitive, supportive adults who know best how to provide for their emotional and cognitive needs." The paper reaches these conclusions by comparing a series of academic analyses on different methods in providing early years education which involve varying degrees of schooling. We spoke to one of the authors of the study, David Whitebread, a senior lecturer in psychology of education at Cambridge University, who also signed the letter to the Telegraph. He told us he is currently working on an article that collates the evidence on this issue; we'll update this factcheck as soon Mr Whitebread's article is published. He also told us that the 2009 Cambridge Review of Primary Education is one of the main documents in support of the campaigners' argument. The review concluded that England should conform to international norms by delaying the formal schooling age to six. It claimed the consensus suggested that "the formalities of the Key Stage 1 curriculum risk denting five-year-olds' confidence and causing long-term damage to their learning." According to the review, postponing the formal schooling age would "give children enough time to establish positive attitudes to learning and to begin to develop the language and study skills essential to their later progress," a statement which echoes the campaigners' concerns as expressed in the Telegraph. One of the main arguments in favour of an early start is that it provides an opportunity for children from disadvantaged backgrounds to learn in ways that they might not have otherwise have done in the home. The Abecederian Early Intervention Project was a controlled experiment on 111 American children born in the 1970s. Of these, 57 were randomly assigned to an 'early intervention' group - where they received an education based on language and games - whereas the other 54 were assigned to a control group, who were cared for at home or in a variety of childcare settings. The study concluded that high quality, educational child care from early infancy was beneficial to children's later academic performance. In the case of the HighScope Perry Pre-school Study - carried out in the 1960s in the US - 123 children aged 3 and 4 were randomly divided into a pre-school programme group designed around participatory learning and a comparison group who were not on the programme. 97% of the participants still living were interviewed at age 40. The researchers found that those who had been on the pre-school programme had higher earnings, were more likely to hold a job, had committed fewer crimes, and were more likely to have graduated from high school than those who weren't on the programme. (Update) Not everyone agrees with the strength of evidence provided by these two examples. Dr. David Whitebread, with whom we've been in touch, has commented on these studies saying that they don't support the case for an early start to formal schooling given that they are studies of pre-school interventions. Phonics: are more six year olds on track to become confident readers? Factcheck: Do formal interventions in schools work? Do only one in six pupils take a core academic subject?